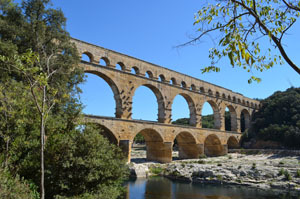 Today we are visiting the Pont du Gard and doing the spectacular drive along the Gorges du Tarn. Waving goodbye to Avignon we drove 25 minutes west to the site du Pont du Gard. Unbeknownst to us today is a special day at the end of the season where certain cultural sites are free. That’s very good because parking at the Pont du Gard is 18 Euros per car (the bridge and museum included). Checked out the museum. Very interesting and new it describes the importance of water for the Romans, with scale models of the bridge and films from old Hollywood movies of the building of it. There was hardly anyone there. Most people pass and go to the bridge. I could have stayed many hours that’s how much there was to learn with very good English translation. The site du Pont du Gard is beautiful. It is an aqueduct built by the Romans starting in 19 BC. 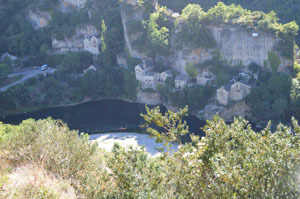 It sits over the river Gardon and was used to bring water from a spring at Uzès to Nîmes. We walked first below and looked up from the banks of the river. Being a weekend and free there were lots of locals picnicking on the banks of the river. You can swim there too. Next we walked on the road beside it which was built in the 1700s. Then hiked above. All amazing vantage points. This is a spectacular site to see and one of UNESCO’s world heritage sites. After lunch (by the side of the road at a picnic bench) we started towards the Gorges du Tarn. Took the north road. 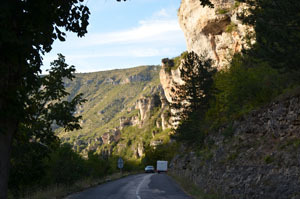 A road with many bends and twists with spectacular views into the canyon and up towards the plateaus. There are little villages along the way to stop and visit. 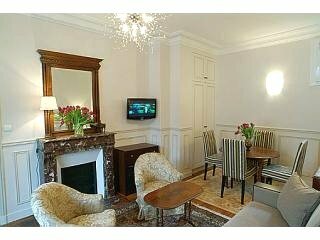 After 4 hours of driving we arrived at our hotel, Hotel de la Muse et du Rozier. It sits right on the road and on the banks of the Tarn. Our room looked over the river, the forest and plateau above. We took a swim in the pool. I really wanted to swim in the river but the sun was going down and the water was very cold. So it was just our feet in the tarn. If I weren’t so tired I would have taken the plunge. Ate a 3 course meal at the hotel. I had very rare pigeon and Gildas, magret de canard (duck). I did not know I was to get bloody pigeon. It was very tender and accompanied by very beautiful things. This is a very hi end restaurant and very French. I tasted blood for 24 hours. A French culture experience I’ll do without next time. I was so hungry I didn’t want to send it back and wait. We were very happy to eat at hotel and not have to drive around looking for restaurant.